Although fashion designers and airlines having partnerships is nothing new, with every era comes a new take on in-flight style. From Emilio "Pucci" to Roy "Halston" Frowick, revamping the uniforms of flight attendants/hostesses and in-flight staff members has always stood out in some way to make a statement. Have you ever took notice of the cabin crew's ensembles when you are in-flight? I usually do. It really comes down to all of the lovely details though for me, from the kerchief pattern to the complete colour story of the uniforms. Nowadays, airlines really have a lot more options to consider with advance technology at their disposal, not to mention a plethora of modern forms to market their brand. There's also a fair amount of ways to express the brand DNA of an airline through the uniforms whilst maintaining the style factor, and the country's culture. Of course, having a limited silhouette and colour palette to design from isn't always easy for designers. 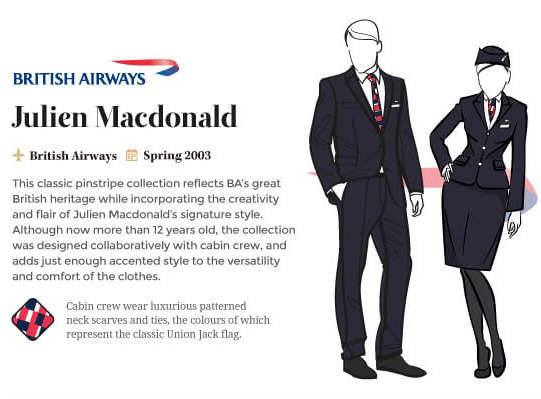 However, somehow these renowned designers (seen below) have managed to create styles unique to the airlines as well as keep their own design signature within the uniform. Check out how airlines like Ryanair used Irish emerging talent, Emma Collopy for their latest uniforms, and Moods of Norway designed uniforms for Norwegian Airlines with whimsy banter printed on certain parts of the uniforms, including the men's socks. Lufthansa went classic, and decided on a savvy pillbox hat for their female cabin crew staff. Both, budget airlines and premier airlines are now continuing to collaborate with fashion designers to update their cabin crew styles. Looking back at the vintage versions of uniforms, there was also bold colour, even pastels, and neutrals worn by the cabin crew. The next time you travel by aeroplane, take a closer look at the fashion elements worn by your in-flight crew. Some of the little details may surprise you. Images: via Cheapflights. This post is brought to you by Cheapflights. All content and opinions expressed are my own. Which airline uniform is your favourite?